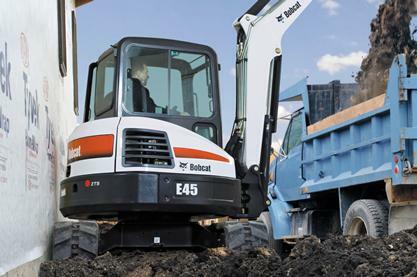 With some jobsites getting tighter, it’s important to rely on compact equipment, specifically Bobcat® compact excavators, that can access confined spaces and still have the power to get the job done efficiently. 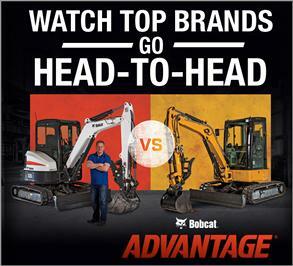 But, how do you know what compact excavator is best? Before bidding on a project and working in confined areas, evaluate the following considerations. First, consider the jobsite and the type of work you and your equipment operators will be completing. If you’re working in established residential neighborhoods with exceptionally narrow passages, measure widths between permanent structures as well as gate or door openings to ensure your excavator can easily travel in between or through openings. When working in very tight spaces, consider using Bobcat E10 and E20 compact excavators. They are designed with retractable undercarriages to overcome challenges where larger equipment cannot fit. The retractable undercarriage allows you or your operators to pass through a gate and then expand the undercarriage when you are ready to dig. In addition, the machines are equipped with a retractable blade to give you greater ability to move in tighter spaces. Today’s compact excavators include a variety of tail-swing types, depending on the jobsite requirements. Minimal tail swing and zero tail swing excavators provide more unrestricted rotation and flexibility when working close to objects or against a wall. The zero tail swing feature virtually eliminates the chance of the excavator’s tail (house) inadvertently contacting surrounding objects and potentially damaging the structure and machine. The minimal tail swing feature significantly reduces the chance of inadvertent contact, minimizing the likelihood of damage to nearby objects or structures. 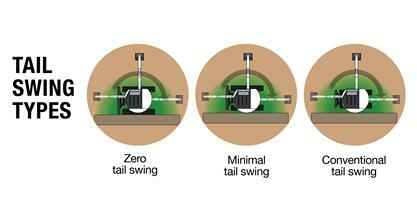 A zero or minimal tail swing excavator of a given size will generally be wider than its conventional tail swing counterpart. If you anticipate routine work where you or your operators must pass through narrow property lines or gates, a conventional tail swing may be a better fit. The typical width of a conventional tail swing, such as a 3- to 4-metric ton compact excavator, will be about 60 inches, whereas a zero and minimal tail swing excavator with similar performance will have a width of about 70 inches. 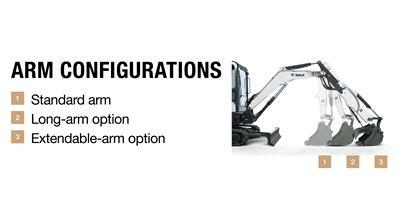 Next, choose the right arm configuration for your excavator and your jobsite. Standard arm configurations come with every excavator model, giving you maximum breakout force and lifting ability with greater digging performance. However, if you need greater reach and dig depth, equip your excavator with a long-arm option. Extra reach, combined with higher dump height allows you to do more work without repositioning the machine and helps load trucks easier. The long-arm option includes additional counterweight to enhance your excavator’s lifting capabilities. If you need even more reach, Bobcat Company offers the only clamp-ready extendable arm option for select compact excavators. It offers the best of both worlds: power and lifting performance, combined with the ability to extend the machine's dig depth and reach when you need it. It delivers up to 30 inches of reach at full extension, compared to standard arms, so you can reach farther with less repositioning – to dump spoil further away from the excavator and reach further back into the trench for cleanout purposes. Loading trucks are easier, too, because the extendable arm allows you to place material more efficiently into the truck without moving the excavator. The extendable arm cylinder is powered by the primary auxiliary circuit. A roller switch on the right-hand joystick controls the extension and retraction of the arm. When equipped with a hydraulic clamp, the roller switch on the left-hand joystick controls the clamp function. Together, it is a simple process to extend the arm and reach objects to lift and place them. In addition, you can operate with standard reach while retaining original arm and bucket forces. The replaceable composite wear pads reinforce the excavator's structure and maintain its integrity. Don’t overlook the importance of attachments. Consider replacing work previously done with manual labor and tools by purchasing or renting an attachment for occasional use. For example, when removing concrete, add a hydraulic breaker to demolish the material. 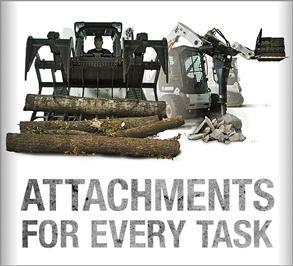 Add a hydraulic clamp for land-clearing applications to quickly grab, lift and load materials. An auger replaces laborers hand digging holes for new footings or posts, as well as landscaping for new trees. Compact excavators can be a versatile solution when working on tight spaces, particularly in urban areas. 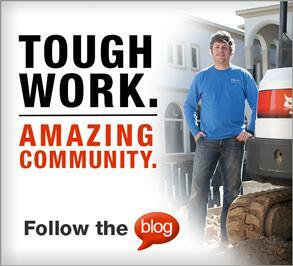 The next time you are working on a confined jobsite, consider going compact.